We’re fully into the autumn season, with fall flavors abundant at the market. Persimmons – both the Hachiya and Fuyu varieties – are a fun fall fruit available now at Twin Girls Farm. 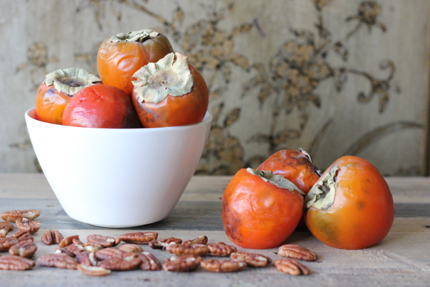 Hachiya persimmons are best used for baking or preserving. When they aren’t fully ripe they have an unpleasant, tannic flavor. Set them out on the counter to ripen. You’ll know they’re ripe when they feel like a water balloon filled with soft, squishy flesh. Fuyu persimmons are the opposite – meant to be eaten when firm and raw, they are sweet and crunchy and make a delightful addition to salads. 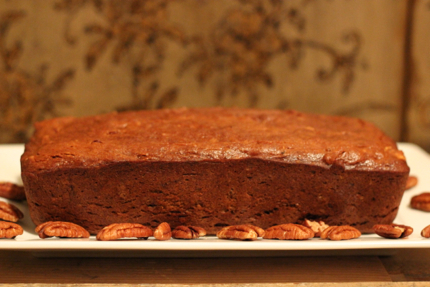 Be sure to buy Hachiya persimmons for this easy one-bowl quick bread recipe. At Twin Girls Farm they will help you pick out the most ripe and ready fruit. For the cup of persimmon puree called for in this recipe, you’ll need about 3-4 ripe Hachiya persimmons. 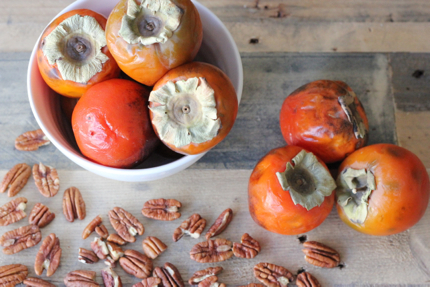 Cut off the top of each persimmon and slice in half. Use a paring knife to remove the small membranes, then squeeze the flesh out and discard the skins. Depending how smooth the persimmon flesh is, it’s optional to puree in a food processor and strain through a mesh strainer. This persimmon pecan bread is moist and sweet with a delicious crunch from toasty Winters Fruit Tree pecans and a subtle boozy flavor from the addition of whiskey, making it a perfect snack on a crisp fall day. And don’t forget to pick up organic, free-range eggs from Great Valley Poultry to use in the recipe. The full recipe is after the jump. Happy baking! 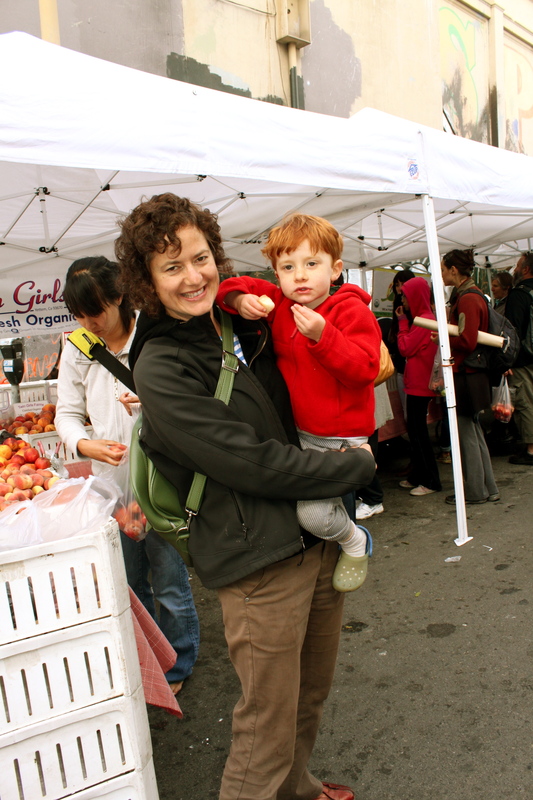 When you visit the market, it’s hard to miss the crowd of customers tasting and buying a delicious variety of plums, pluots, and other stone fruit from Twin Girls Farm. 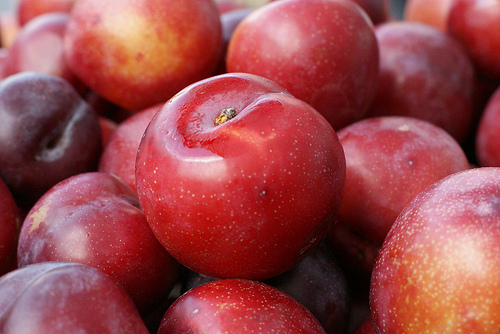 Now’s a great time to get your plum fix while they are still in season through next month. Enjoy them now, or you’ll have to wait for their return next year in late spring! 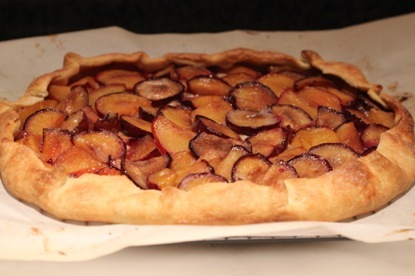 Plums work beautifully in a rustic tart, also known en Francais as a galette. Flaky tart dough wrapped around colorful plums makes a striking dessert sure to get oohs and ahhs from your family and friends. Oh, and it’s also tasty and surprisingly simple to make! While plums are highly recommended, you can substitute almost any fruit in this recipe and customize your galette according to what’s in season. 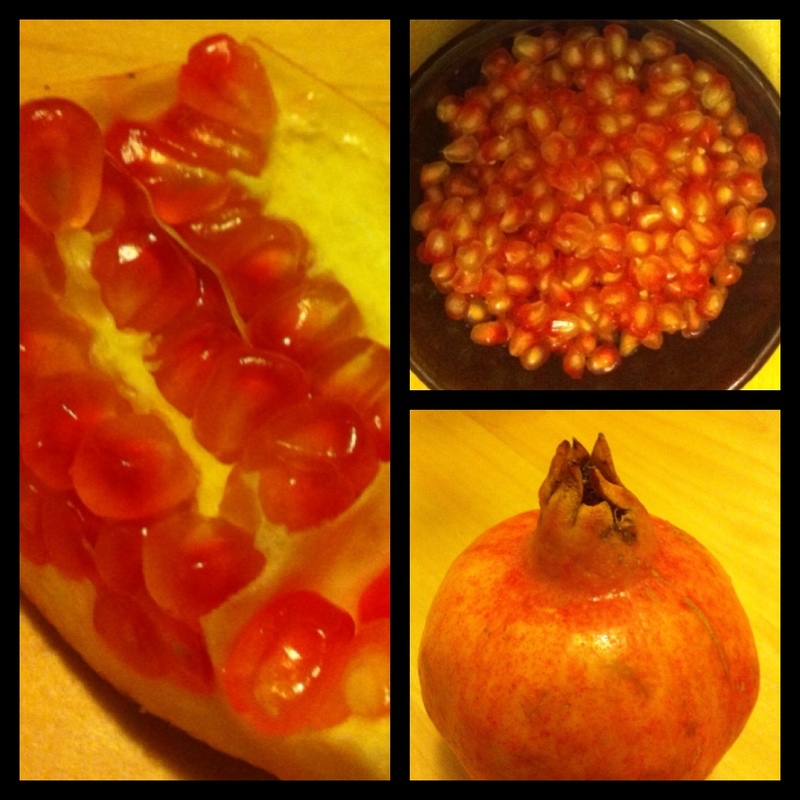 Last week we spotted some unique pomegranates at the Winter’s Fruit Tree stand. That’s right–the folks that bring you delicious varieties of nuts every week also have some delicious fruit to share! While most of us are used to seeing the “Wonderful” variety of pomegranates (deep red in color, delicious and available from Twin Girls Farm and Arata Farm at MCM), Phil Carter of Winter’s tells us that these light-colored poms are coming off 60-year-old trees on his property–trees so old that he isn’t quite sure what variety they are. He says that these fruit (sometimes called “white pomegranates”) are a variety that most likely originated in the Middle East, as it’s much more common to see lighter pomegranates there. The seeds are light pink in color–somewhat reminiscent of cotton candy–and the flavor is sweeter and more mild than their Wonderful counterparts, without any tartness at all. 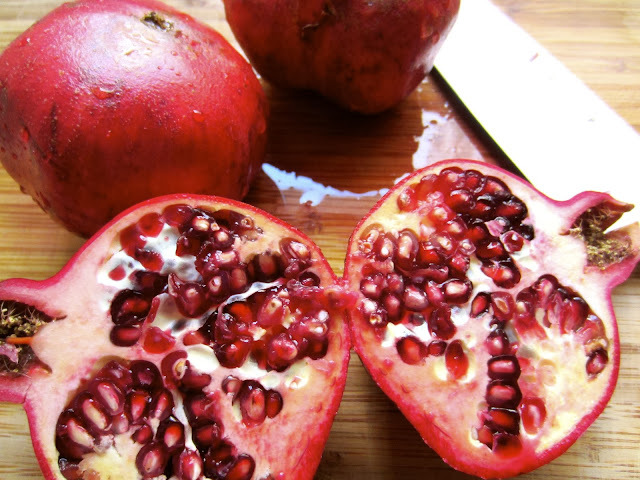 This delicious pomegranate didn’t last very long at this taste tester’s house…and we’ll definitely be going back for more next week. And so should you! Meet Shannon and Silas, regular market attendees and supporters of the MCM community. We got the chance to speak to them while they were tasting juicy stone fruit samples from Twin Girls Farms. How often do you come to MCM? About every other week. We counter balance our visits with our CSA box which we receive from Eatwell Farm. We haven’t started our shopping yet but we often come to MCM for inspiration on what to make for dinner that night. Today we will definitely be buying some of these peaches and nectarines from Twin Girls Farm. What’s your favorite part of the Market? MCM is a family-oriented environment. It is not just commerce taking place here but connections within the community. We often see friends and people we know here. We also love the live music. What’s the best kept secret at MCM, or something you would like people to know about? We are really excited that MCM is on the verge of getting growing into more of a community establishment. The momentum and support behind the Mercado Plaza has been exciting to be a part of and watch. Thank you Shannon and Silas!